The other weekend, I finally made it to the annual Slow & Low Lowrider Festival in Pilsen. Over 200 cars and bikes lined the road in an industrial part of Pilsen just off Cermak for a day founded by the Chicago Urban Art Society. 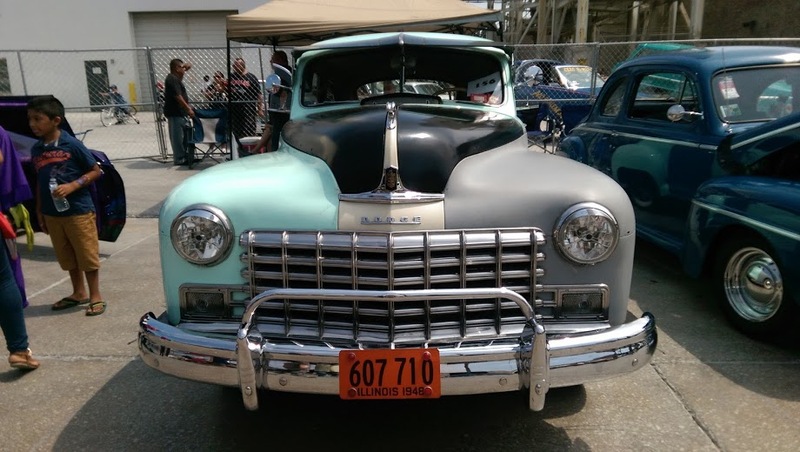 I’m not a car expert, so don’t expect any super detailed descriptions of makes or models, but there was a huge variety of rides, from old-school cars that looked like they’re from the 50s to modern-day lowriders with hydraulics. As we strolled the festival, I immediately regretted not dressing more thoughtfully for the occasion. Meaning, I wish I had worn my 50s-style halter dress with roses, guns and skulls on it. Back to the cars. Looking at the older cars, I was fascinated mainly by two things – the tires (vintage white walls) and the dashboards (seeing what the old speedometers looked like). How cool is this tire? It was amazing to see how much care must go into maintaining these cars – whether it’s the condition of 50+ year-old vehicles or the paint jobs of the newer ones. Speaking of paint jobs, I was especially drawn to cars that were colored in oranges and browns. There was definitely some skilled craftsmanship on display. Beyond that, the location of the show set the perfect vibe. You could just picture drag races taking place on that industrial strip for the past 50+ years. Signs and billboards for Ozinga, a concrete mix, served as the backdrop for a lot of my shots.